It’s official: T-Mobile customers continue to be the happiest. 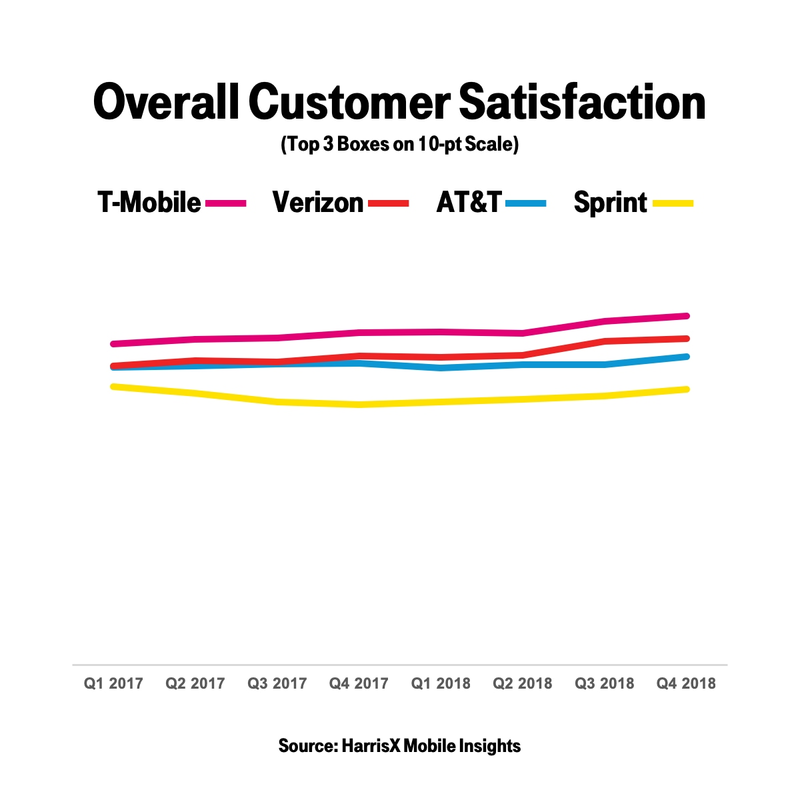 Un-carrier customers are the most satisfied in wireless two years running, rank T-Mobile highest for Quality AND score the fastest LTE network for the fifth year in a row. 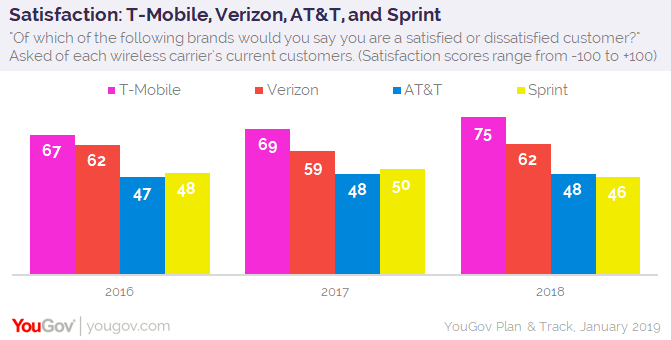 Un-carrier customers are the happiest in wireless for the second year in a row according to two different sources. 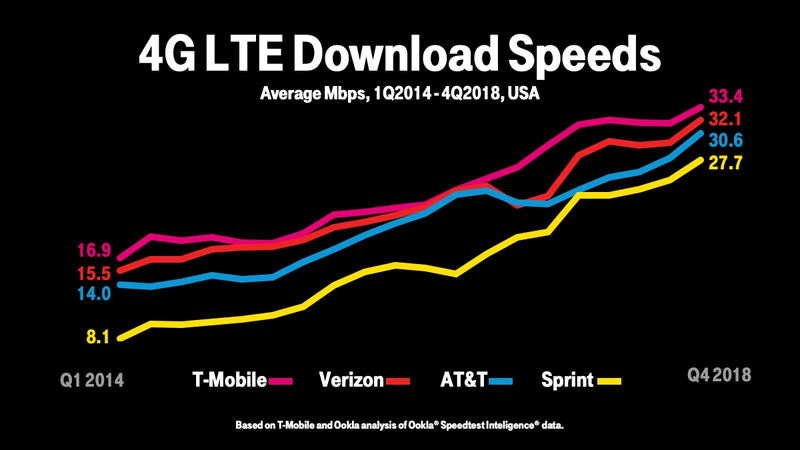 And the Un-carrier’s LTE network is fastest for the fifth straight year. 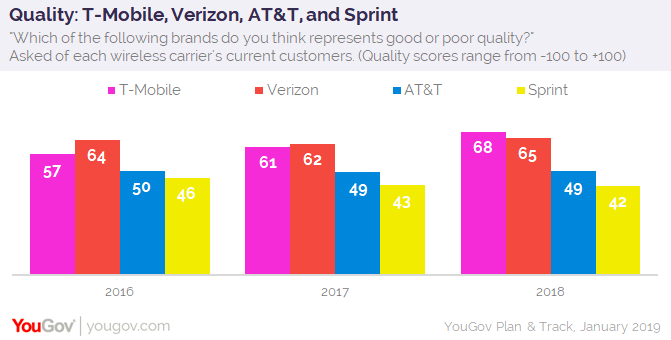 Plus for the first time, T-Mobile led all major wireless providers on Quality. Life’s too short not to love your wireless provider, or deal with slower networks and carrier BS. Wireless customers everywhere who want the best network, best quality, and just the best wireless experience there is. Yep, T-Mobile is the most loved in wireless for a reason…or three. Bellevue, Washington – January 22, 2019 – It’s a good time to be with the Un-carrier. 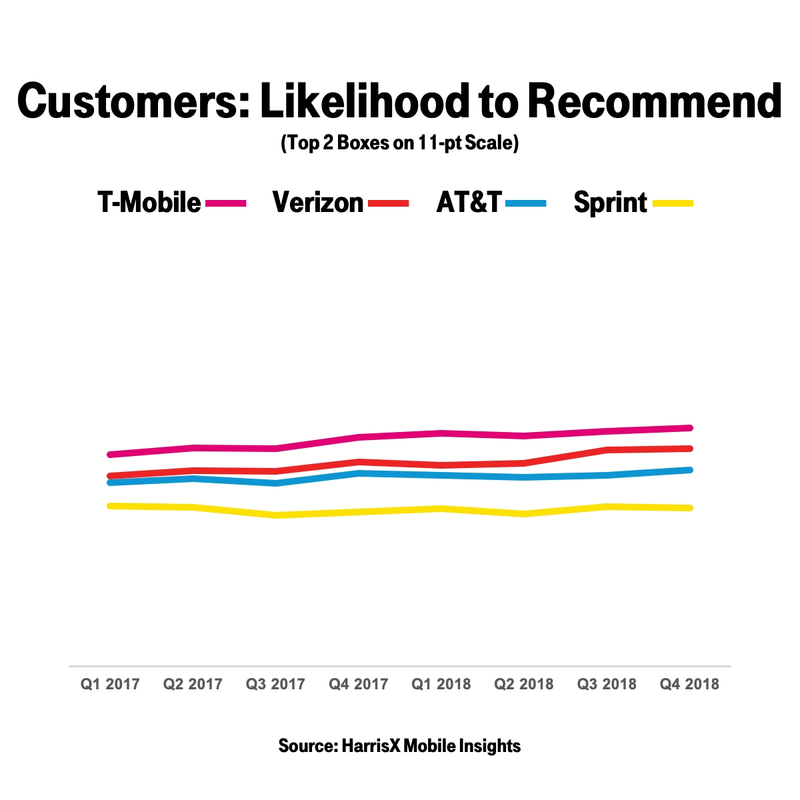 T-Mobile (NASDAQ: TMUS) customers are starting off the new year on top yet again, with two independent studies showing they’re the happiest in wireless for the second year in a row. And for the first time, T-Mobile led all major wireless providers on ratings for Quality. 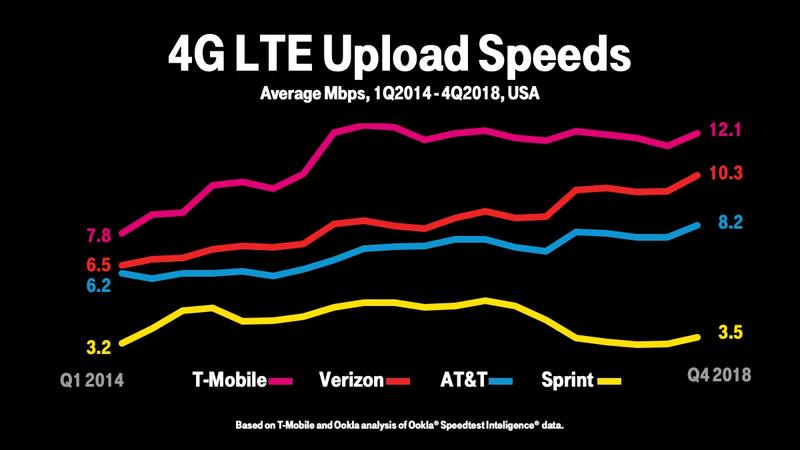 Maybe that’s because Un-carrier customers are enjoying the fastest 4G LTE upload and download speeds for FIVE YEARS in a row (20 quarters or 60 months or 1,826 days … and counting). That’s based on millions of actual customer experiences across all wireless providers by Speedtest Intelligence® data from Ookla®. With the most LTE-Advanced coverage in the nation, T-Mobile just dominates network speeds, innovating and deploying new technologies so customers get fast and reliable coverage to use their devices whenever they want, from virtually anywhere. Speed-boosting LTE-Advanced technologies – including carrier aggregation, 4x4 MIMO and 256 QAM -- have been deployed in more than 6,000 cities and towns in the U.S., and T-Mobile’s LTE coverage is neck-and-neck with AT&T and Verizon and growing. And, the Un-carrier is aggressively rolling out 600 MHz Extended Range LTE, which travels twice as far and works four times better in buildings than mid-band spectrum, with coverage already in more than 2,700 cities and towns across 43 states and Puerto Rico. But being on the fastest network in the nation isn’t the only reason T-Mobile customers are the happiest in wireless. Maybe it’s because T-Mobile launched Team of Experts – a dedicated team of real people to help any time you call or text, with no bots, no bouncing and no BS. It could be because T-Mobile has blocked over a billion scam calls and offers an entire suite of free scam protection options for customers, including Scam ID, Scam Block and Caller Verified. Or maybe it’s because T-Mobile ONE customers get taxes and fees included, Netflix on Us with family plans, and the industry’s best travel benefits including a free hour of Gogo Wi-fi when traveling domestically and unlimited texting and data in over 210 global destinations. Or it could be the $1,550 in added value Un-carrier customers get every year including free stuff and discounts every Tuesday. For more information on T-Mobile’s network, visit T-Mobile.com/coverage. YouGov Plan & Track data is based on daily polls conducted between January – December 2018 involving a nationally representative sample of more than 35,000 U.S. consumers and each respondent’s self-reported net perceptions (% positive - % negative). Satisfaction is calculated by taking the percentage of satisfied customers and subtracting it by the percentage of dissatisfied customers. Satisfaction is based on a 3-point scale (positive/negative/neutral). Quality is calculated by taking the percentage of customers who think a brand represents good quality and subtracting it by the percentage who think a brand is poor quality. Quality is based on a 3-point scale (positive/negative/neutral).